This Cutie Cat Night Light has a soft white and pink look that will create delicate lighting ready for bedtime. The light will turn off after 15 minutes to conserve energy. Cat and butterfly wall art sticker. 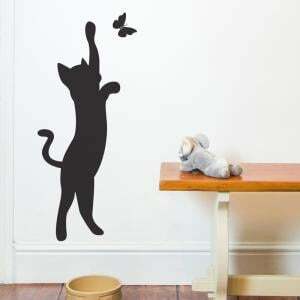 This adorable fun cat wall sticker will make a brilliant addition to any wall in your home. Our beautifully ..
Make a feature wall with these cat wall stickers. Our decorative wall stickers are easy peasy to apply simply peel and stick! All our wall stick.. This super cute kawaii japanese style night light is for any little cat lover. This night light has a 10-15 minute timer so there is no need to have t..
A cute small cat rug in the japanese kawaii style. ..